Dago brought ceviche today!!! It was delicious. A bunch of us were waiting for Abel, Pepe and Bette to finish the Placerita Canyon run (around 20 miles), but most people left before I could take a photo, so I just took a photo of the 3 brave souls. Wild Mountain Runners Freddie, Patti and Ted before the race. Thanks to Sal for getting us in for $10.00 each! What a marathon! Hills and heat and beautiful scenery. A real challenge. Today's run was brutal...7 miles UP, and I mean UP!, and 7 down. 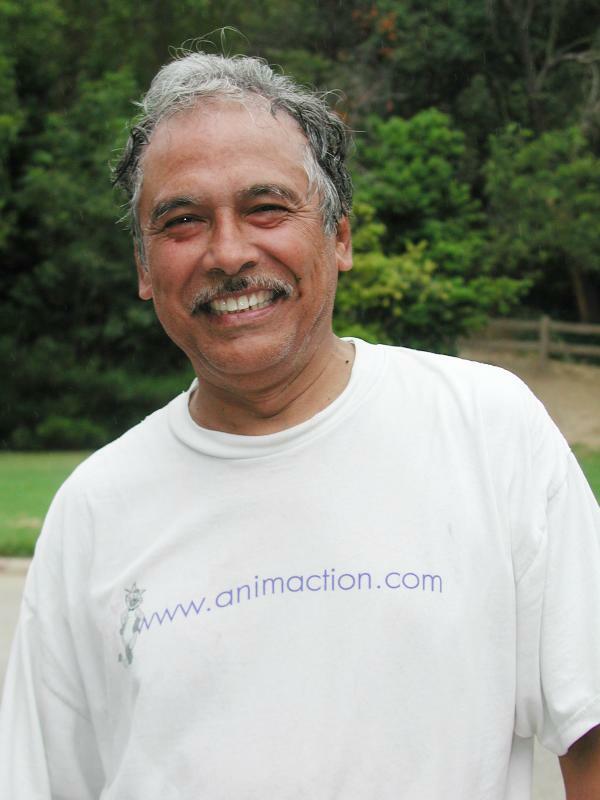 One early morning while running through the mountains of the Los Angeles National Forest, Freddy Perez, our club founder, suddenly crossed upon several large paw prints. He slowed his pace but continued on the narrow trail. Then again there they were, great paws prints that appeared and then suddenly disappeared into the thick brush. Freddy thought about the danger but it was excitement and inspiration that suddenly overwhelmed him. There he was running in the path of a wild animal. This animal was free to run and roam the mountain unhampered by civilization. The participation of the WMRs at the Jimmy Stewart Relay Marathon event once again turned out to be a huge success. 45 WMR Runners consisting 9 teams, 5 from L.A. and 4 from San Fernando, competed in different divisions. The cat logo imprinted on our new uniform enable us to proudly advertise both our outstanding running club throughout the years and our level of commitment in running. The results we were able to achieve were impressive. WMR V placed 1st in the Seniors (corporate) Mens Division (Time 3:42) Team captain Ray - Our runners in this division are looking even better each year. WMR IV placed 1st in the Coed Division (Time 3:00) what a remarkable accomplishment! Just being in the top 3 would have been something to brag about, but to win it! Well done to team captain Larry and his team mates Araceli, Ricky, Rosa & Fernando. 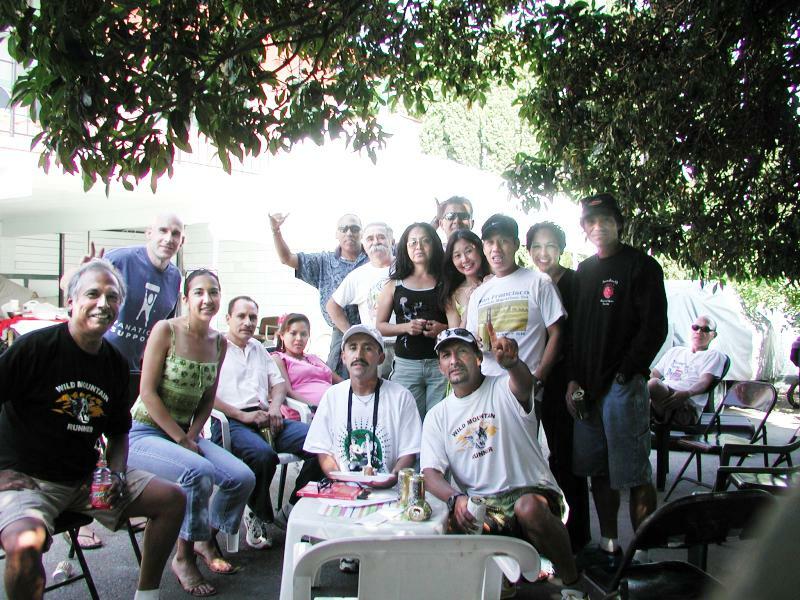 Team members: 2 mile - Larry , Rosa , Fernando, Ricky & Araceli. San Fernando Valley WMR II placed 3rd (Time 2:56) Master (corporate) Men Division (If I were you Kadafee, Id closely look over your shoulder next year). Way to go San Fernando Gatos! To Angel -Keyano- from the Amarillo Running Club who helped to obtain major discounted rates on our entry fees. His networking has certainly been a bonus to the Wild Mountain Runners. To Steve Borough and Kitty, who arrived before the bats returned and reserved the tables for us at the park before the race. Last but not least, thanks to everybody who contributed to the picnic. "In running, it does'nt matter whether you come in first, in the middle of the pack or last. You can say 'I have finished.' There is a lot of satisfaction in that"
For those who were watching Fox 11 News @ ten p.m. on Wednesday, April 28, 2004 Maggie was interviewed by the news media after a mountain lion sighting at Griffith Park. She was very calm, very informative, very focused and clear on her responses. By the way, Maggie has been appointed our official WMR spokeswoman (she doesnt know about that yet). Chris and Araceli who were caught on camera while stretching during the interview, have been offered a modeling contract with Nike. Both were admired by their *runners legs*. Both are still pending decision on the lucrative offer. This will definitely help you improve, focusing more into comprehensive training and running publishing. Is he incognito dressed as a mountain lion? Stay tuned for more news. Roberto Perez trains like he competes and competes like he trains. Those who join his Sunday training runs know that they are in for a serious workout. Those who challenge him in any race know that they will have endured a lot of pain keeping up. To beat Roberto, you will have to spill your guts as the great Steve Prefontaine would say when challenged by competitors. Challenging himself and others has been Robertos trademark. Roberto was born in Mexicali, Mexico, the youngest of five children. His love for competition began at an early age. At age 8 his baseball team, Los Piratas, won the Baja California state championship. At age 13, he immigrated with his family to the United States. Roberto later attended Belmont High School where he competed in soccer. At the Los Angeles City Soccer Championships he became a school hero when he scored three goals against Garfield High School capturing the championship. His interest in running began when he saw Belmonts cross-country team compete. Upon seen the competition Roberto said *I knew I could beat them* and soon joined Bob Macias (WMR member) who also ran for Belmont. Roberto joined the Gatos in 1984 when Freddy Perez met him at Griffith Park and asked him to join his then fledgling team. Since then he has remained a loyal and committed member. 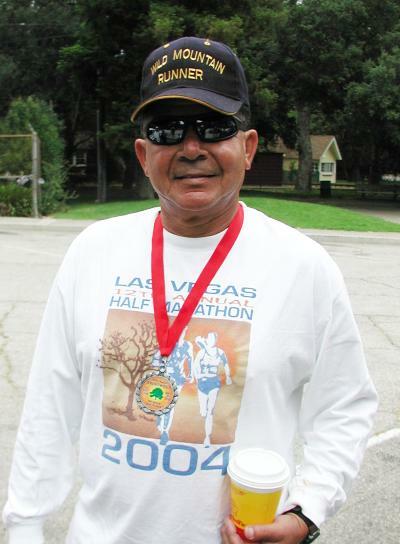 As a Gato, Roberto has run 32 marathons, including the Los Angeles Marathon, which is his favorite. He ran his best marathon time at the first LA marathon in 2:50. 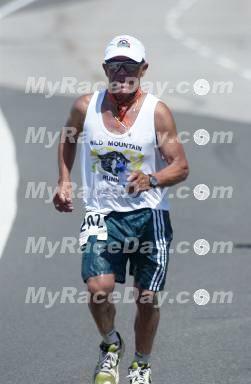 His fastes � marathon was at the grueling San Pedro � in 1:17:48. His best 5k was 17:03 and his fastest 10 k was 35:06. However, he is quick to say that his favorite run will always be Lake Isabella. At Isabella, Roberto competed in the 38 mile ultra and as a member of a relay team. On Nov ember 22nd, the Wild Mountain Runners places seven runners in the top 30 slots at the Arturo Barrios Reebok Invitational. Despite the rain and cold morning, Javier (Guajach) Perez led the Wild bunch with an outstanding time of 31:03, which is an average of 5:03 per mile and was good enough for an overall 3rd place finish. Carlos Navarro finished 4th with a time of 31:24 and Roberto *El Chino*Rodriguez finished 7th with a time of 31:49. Leading the seond pack of Lions was Master runner Steve Keyes. He crossed the finish line with a time of 33:22 and was the first master runner overall. Hot on Steves heels were Pepe *El Brochero* Gomez and Joel Sanchez with times of 33:30 and 33:34, respectively. German *Sorullo* Alonzo was right there with Pepe and Joel with an equally impressive time. German who has been coaching many of the Wild Mountain Runners at the Cal State LA track, accomplished what he had sad he would do, which was to break 34:00. Salvador Arellano completed the course in 34:07. He said that he was disappointed with his performance, but considering that he was fighting a bad cold he did remarkably well. Faustino *El Cuete* Campos proved to Gilbert *4-mile* Varela that he is a force to be reckoned with by almost ousting Gilbert and finishing in 35:31, which was only a second slower than Gilberts time. I myself ran the race in 36:16, which is the fastest 10K Ive done in a long time. To everyone, CONGRATULATIONS. Today, we ran the the JPL/NASA trail, starting from Hahamonga Park up 7 miles and down 7 miles.